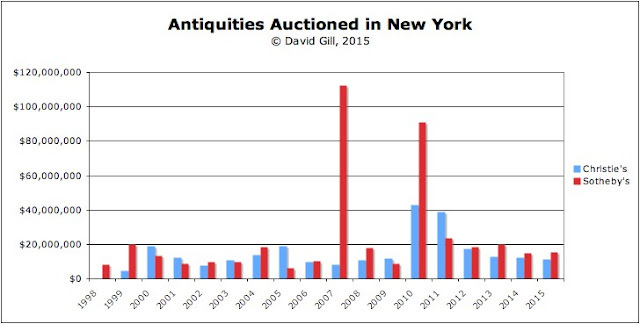 The two major sales of ancient art at Christie's and Sotheby's took place in New York this week. The four sales of ancient art throughout the year raised some $26 million, half a million dollars down on 2014. Once again Sotheby's sales raised more than Christie's: $15.3 million against $10.9 million. This is the fourth year in succession where Sotheby's has been ahead. Sotheby's sold slightly more than in 2014, whereas Christie's were significantly down (at 2008 levels). We should also note the move to the title 'Ancient Egyptian Sculpture and Works of Art' at Sotheby's for the December sale.